This is a really useful overview of the QOS behaviour. You mention “The Consumer manages its own Shared Queue in memory.” – I was wondering how this would work in a Round Robin scenario? 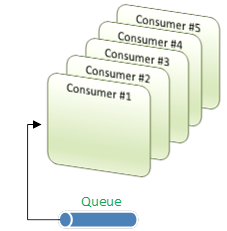 Example: 1 queue with 2 consumers – no QOS value, so dispatching with round-robin. 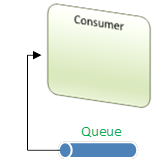 If there are 1000 messages added to the queue, each one will be dispatched, in order, to the 2 consumers. If the consumer is only capable of processing 1 message a second, would that mean each consumer would have 499 messages backed-up in it’s Shared Queue – potentially leading to load/memory issues on each consumer? Theoretically, yes. However, without a working example it’s just a hypothetical. But, yes, 499 backed-up messages should result in each queue. I wouldn’t worry too much about memory consumption, unless the consumer is particularly slow, which is another issue entirely. The general rule of thumb with pub/sub systems is that consumers should return quickly as possible, and long-running processes should be segmented out-of-bounds, where long processing-time does not affect day-to-day operation of the rest of the application.